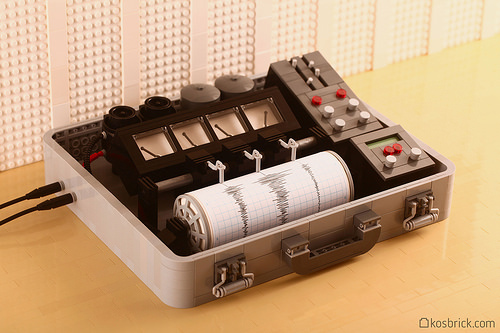 It is strangely appropriate that Kosmas Santosa, a builder from Jakarta, Indonesia, has built a LEGO seismograph. Indonesia is a country that is heavily affected by earthquakes due to its location within the Pacific Ring of Fire. Kos has been utilising the ‘paint roller‘ in all sorts of ingenious ways this month, and his vintage seismograph is no exception. The locks on the front of the case, the levers on the top right of the machine and the pens that record the output are all constructed from the paint roller. I wonder what happens when you press the red buttons?